"Epson recognized the need for a fast and easy scanning solution that enabled people to digitize photos held captive in shoeboxes and albums stored away in closets and attics, and vulnerable to natural disasters, fires and floods," said David Hawkes, product manager, Scanners, Epson America, Inc. "FastFoto unlocked a new market with the introduction of the FastFoto in 2016, making it affordable and feasible to preserve a family's legacy. The new FastFoto FF-680W incorporates feedback from customers with a host of new features, making it easier to bring memories of yesterday back to life using the latest digital technology." 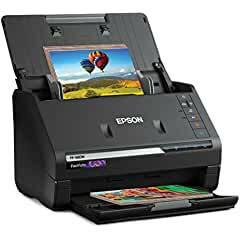 Featuring Epson ScanSmart software, the FastFoto FF-680W scanner is also a powerful document scanner. Using the intuitive software users can easily scan, organize, email, and store important contracts, receipts, documents, and files. In addition, easily edit documents and save time with automatic file naming, plus powerful productivity tools. With built-in Nuance® OmniPage Optical Character Recognition (OCR), users can create searchable PDFs, plus editable Word and Excel® files. The Epson FastFoto FF-680W scanner (MSRP $599.99) is now available through select major retailer stores nationwide and online at Epson. It comes with Epson's top-of-the-line service and support, including a one-year limited warranty.